Elvis in March—During the early part of his career, March always found Elvis out on the road. In 1957 he started his last concert tours of the decade in March. 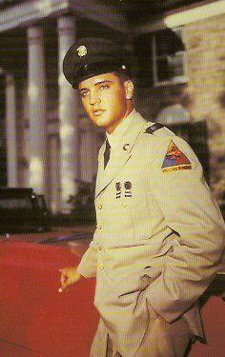 It was also during March that Elvis was both inducted and discharged from the U.S. army. As noted below, during the 1960s Elvis often went to Hollywood during March to make movies. March 26, 1956 — Elvis began a three-day screen test for Hal Wallis at Paramount studios in Hollywood. March 28, 1957 — Elvis wore his gold lamé suit in public for the first time during a concert at the International Amphitheatre in Chicago. March 24, 1958 — Elvis was inducted into the army in Memphis. March 5, 1960 — Elvis received his honorable discharge from the army at Fort Dix, New Jersey. March 20, 1960 — Elvis started his first post-army recording session at RCA’s Studio B in Nashville. March 21, 1961 — Elvis started the Blue Hawaii recording sessions at Radio Recorders in Hollywood. March 25, 1961 — Elvis performed a benefit show for the U.S.S. Arizona Memorial at Bloch Arena in Honolulu. It was his last live appearance until his return to the Las Vegas stage in 1969. March 28, 1972 — Elvis recorded “Burning Love” at RCA’s Hollywood studio. Elvis often made a movie in the spring for release during the holiday season later that year. Principal photography began on the following Elvis movies during the month of March. King Creole — Paramount began location shooting in New Orleans on March 3, 1958. Blue Hawaii — Paramount began three weeks of location shooting in Hawaii on March 27, 1961. Roustabout —Paramount began location shooting at the Hidden Valley Ranch, north of Los Angeles, on March 6, 1964. Harum Scarum — MGM began shooting in Los Angeles on March 15, 1965. Clambake —United Artists began shooting in Los Angles on March 22, 1967. Live a Little, Love a Little — MGM began shooting in Los Angeles on March 13, 1968. Change of Habit —Universal Studios began shooting in Hollywood on March 12, 1969. The following Elvis movies were released nationwide during the month of March. Easy Come, Easy Go — released by Paramount on March 22, 1967. Charro! — released by National General on March 13, 1969. On the morning of March 19, 1957, Mrs. C. R. Hughett, 53, walked up to the desk of Robert Johnson, a writer for the Memphis Press Scimitar. She handed him a letter of introduction from Carolyn George, an eight-year-old third-grader in Cleburne, Texas, near Fort Worth. It seems Carolyn was an Elvis Presley fan and had saved up her allowance for six months to buy Elvis a present. Once she had purchased the gift, she wanted to make sure that Elvis got it, so she asked her grandmother, Mrs. Hughett, who had a pass on the Santa Fe railroad, to deliver the package for her. “This is to tell you about my grandmother. I’m sending her to Memphis to represent me, as I am in school and my Mommy won’t let me come now. 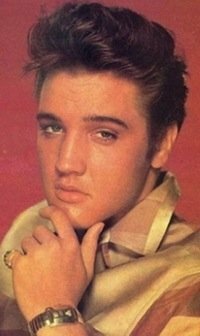 I fell in love with Elvis Presley when I saw him on the Ed Sullivan show, and then my Grandmother Nanny took me over to Dallas to see him last October. March 15 — D.J. Fontana, Elvis’s drummer, was born in 1931. He died on June 13, 2018. March 16 — Ray Walker, bass singer for the Jordanaires, was born in 1934. March 17 — Actor Kurt Russell, a child actor in It Happened At the World’s Fair, was born in 1951. March 19 — Ursula Andress, Elvis’s costar in Fun in Acapulco, was born in 1936. March 20 — Jerry Reed, writer of Elvis songs “Guitar Man” and “U.S. Male,” was born in 1937. He died in 2008. March 29 — Arthur O’Connell, who costarred with Elvis in Follow That Dream and Kissin’ Cousins, was born in 1908. He died in 1982. March 30 — Red Robinson, the hall of fame DJ who recorded Elvis’s 1957 press conference in Vancouver, B.C., was born in 1937. March 31 — Hoyt Hawkins, a member of the Jordanaires, was born in 1927. He died in 1982.